The wife of Luis Domínguez, one of the amateros who sells painted amate on the streets of Oaxaca, painted this faux codex that draws scenes from real codices, chosen and assembled to tell the story of life for Nahuas in pre-Columbian times through conquest and colonization (reading from right to left). 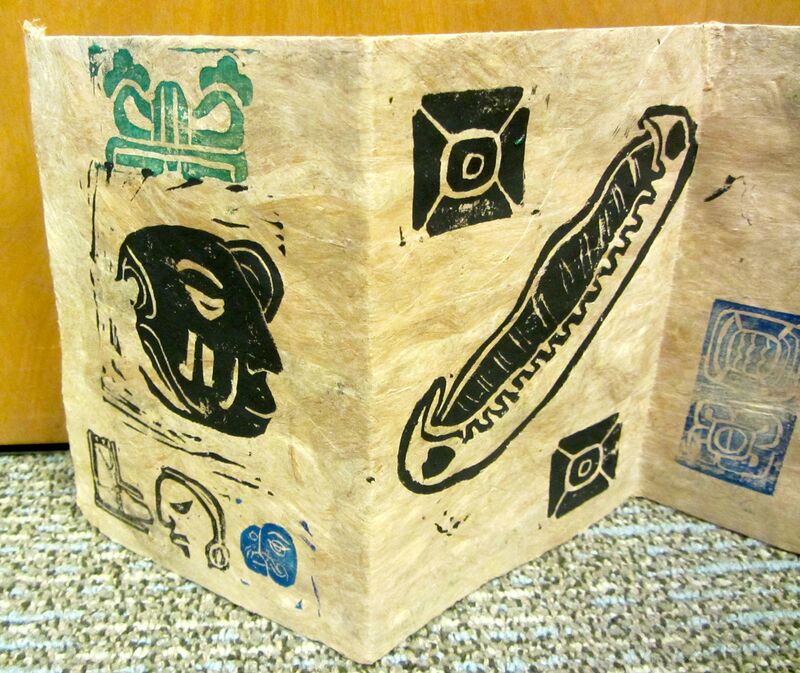 One large sheet of amate was cut in half horizontally, and the ends were taped together to make one long strip. Then the paper was screen folded, creating a space for eight individual scenes. One can browse through historical codices to see the kinds of content a codex would have typically had, and then copy that content, painting it onto the natural amate paper. One can also paint the paper with a whitewash. Many codices were painted with this background, as it made the paper smoother and helped the designs stand out. 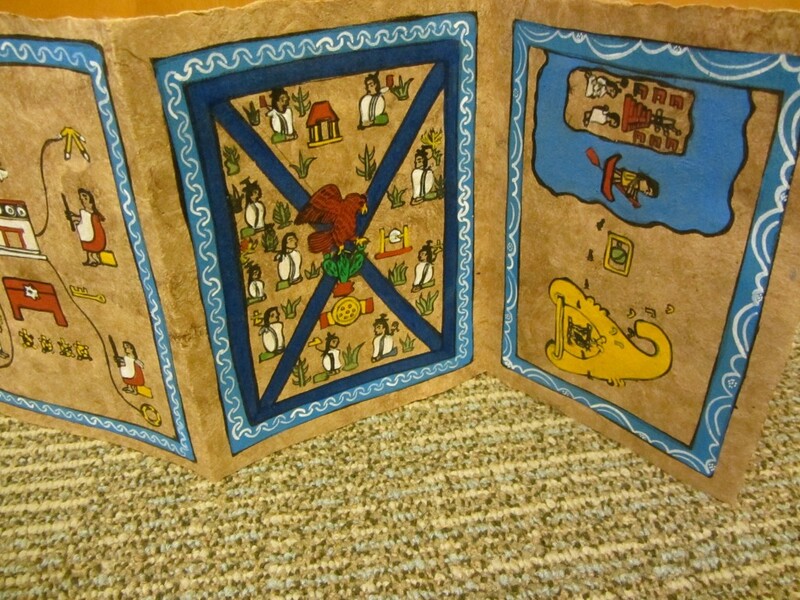 The story begins on the right (above) with the migration from Aztlan, drawing from the Codex Boturini (the artist added her own coloring). Normally, one would not have to turn the codex sideways to view the first scene, but the artist felt it fit better that way. Aztlan was located on an island, where we see a temple and six houses as well as a couple. Only the woman has her name spelled out in a glyph (apparently this represents the name Chimalma, with shield, chimalli, at the root). A fellow in a canoe will take them off the island, and they will begin their journey, a journey that will eventually lead them to the place where they will find the prophesied eagle on a cactus and know that they are to found their capital city (Mexico-Tenochtitlan) on that site. The second scene, from the Codex Mendoza, shows the heart of the Aztec empire, Tenochtitlan at the center (symbolized by the eagle on the nopal cactus), with elite (male) indigenous lords sitting on their thrones (icpalli). The region has a four-part division; the Nahuas had an inclination to favor socio-political units with a symmetrical organization. The third and fourth scenes (above) show glimpses of community life and the types of tribute that communities had to pay to the Aztec emperor. The fifth scene (above, right), adapted from the Florentine Codex, shows men playing percussion instruments (the huehuetl and the teponaztli drums). 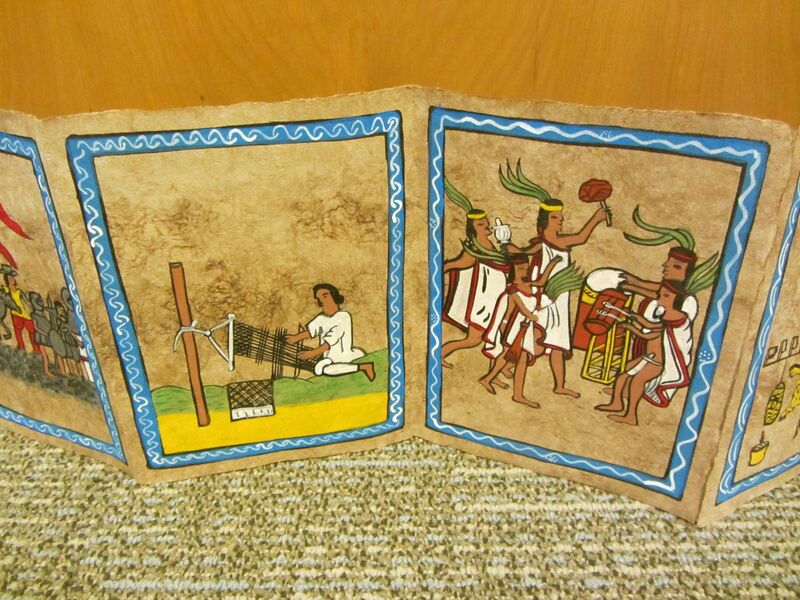 In the sixth scene (left), also adapted from the Florentine Codex, a woman weaves using a backstrap loom. The woman’s traditional posture was to sit on the earth with her legs tucked under her. Men more often sat with their knees up under their chins. In the seventh scene (above, right), adapted from the Codex Azcatitlan, we see a scene of the Spanish conquest march, with men in armor and carrying weapons, a horse, and a banner. This symbolizes the change in political rule, as the Spaniards replaced the Aztecs as imperial lords (while still retaining members of the indigenous elite to rule with and through, to keep the tributes flowing). 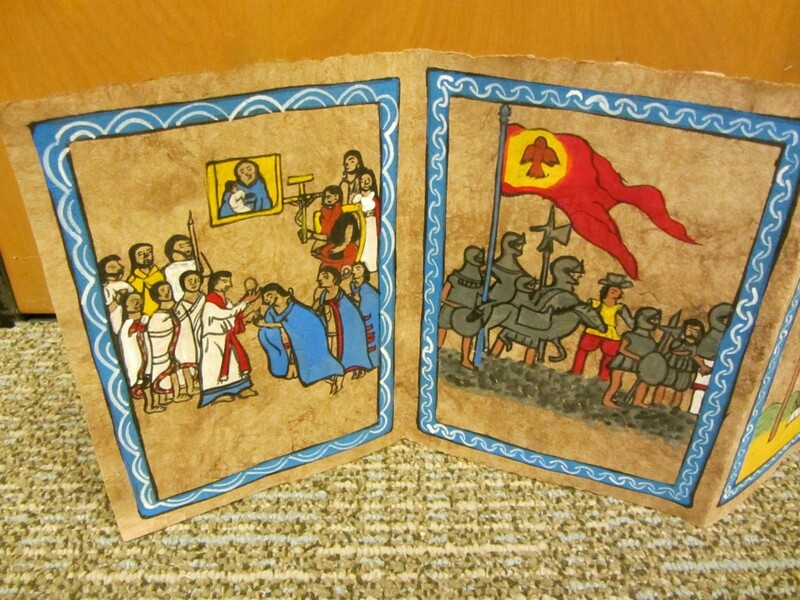 The eighth and final scene (left) is a baptism scene from the Lienzo de Tlaxcala, symbolizing the religious change that was mandated by the new Spanish overlords. 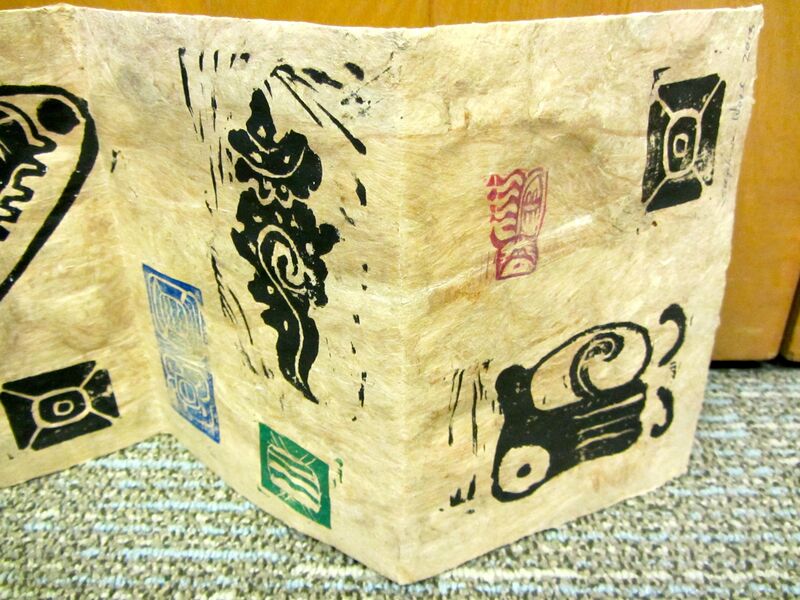 In another workshop, we tried carving our own stamps with glyphs and glyph-like symbols, which we printed on screen-folded amate, to make another faux codex. 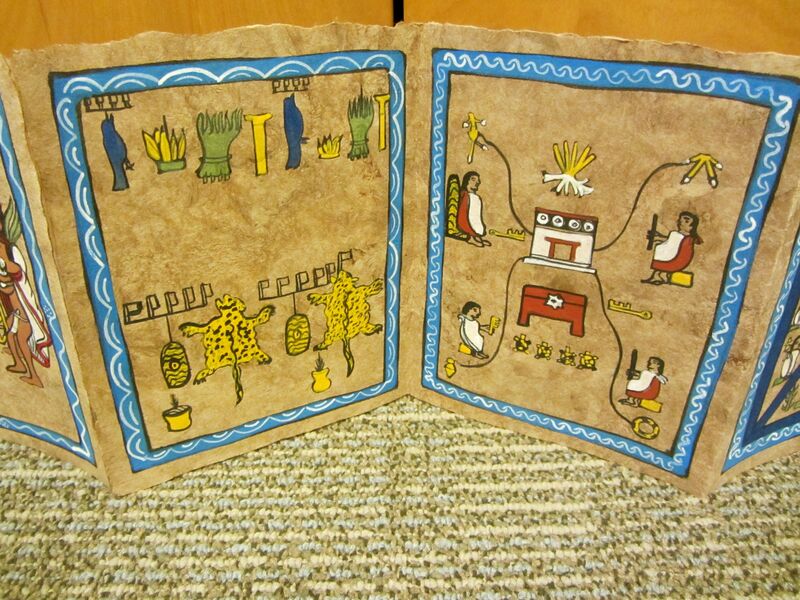 This example (above) mixes Maya glyphs with Nahua symbols and even a canoe from a Northwestern U.S. tribe! It is therefore unorthodox in the extreme, but we were trying out different techniques. Here is a story of a Mixtec migrant who goes to the United States and has many travails. It takes the form of a “codex.” It is created by Duncan Tonatiuh. 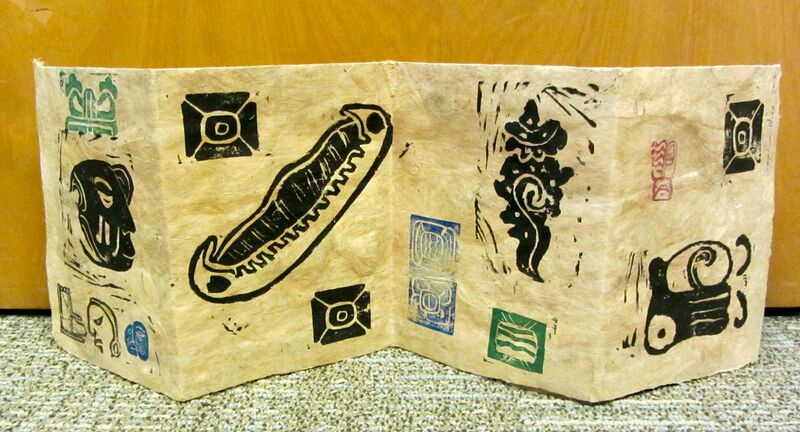 Please also see contemporary Latino artist Enrique Chagoya’s screenfold codex piece.